The outlet sector is continuing to outperform wider retail in the UK according to global real estate advisor CBRE. 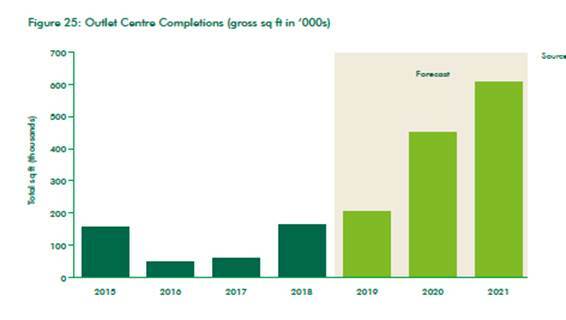 In its latest retail property perspective, CBRE reports that outlet sales have grown at a faster pace than all shopping centres in recent years. A number of UK centres recorded close to double-digit sales per year between 2012 and 2017 and Bicester continues to dominate the sector, generating sales densities higher than any other mall in the world. The sector’s strong track record over the last decade has attracted investor attention. Once solely the domain of outlet operators backed by UK-based institutional capital, outlet centres’ investor base has diversified to include REITs and global capital. Outlet centres offering clarity of occupier performance, affordable rents and consumer popularity have proven to be more resilient. Yields are now on par or at a premium to shopping centres, with limited investment oopportunities ensuring continued depth of demand. To improve their attractiveness and extend dwell time, many outlets are increasing their food & beverage and leisure offering. Peel Outlets rebranded to Lifestyle Outlets, reflecting a desire to attract families as a leisure destination, and Icon Outlet at The O2 (the largest entertainment arena in the world) has delivered premium outlet shopping to a leisure destination. In addition, brands’ growing sophistication in using ‘made for outlet’ to supplement excess stock, and avoiding cannibalisation of trade at nearby locations, has driven growth in more urban areas such as London to access major populations. According to the report, the UK has the highest floorspace of outlets per capita in Europe, but a large part of this is outside the top 10-12 outlet centre assets. There are still areas where outlet penetration is low, and development opportunities exist. Although 2019 will be made up of extensions, 2020 will see two new additions to the premium outlet market when Cannock and Scotch Corner open for business. Glasgow and Grantham are also expected to see new outlets in the next few years, and there is a conceivable long-term pipeline beyond 2022 of around 85,000 sqm across four to five outlets. Rhodri Davies, head of UK retail at CBRE, commented: “Outlets have become increasingly attractive to brands and investors alike. Flexible lease structures, with strong landlord controls and the capacity for operators to achieve a swift return on investment through increases in sales, provide a stable platform for investors. While the discount model seems to resonate increasingly with shoppers.